Benicia, CA, March 29, 2019 --(PR.com)-- VOENA Music Camp: Learn VOENA classic world music songs with percussion and drumming, Aeolian and Ionian Solfege. No experience necessary. Fun, basic introductory to music for all, more advanced repertoire and percussion for those campers with musical experience or who have taken past camps, leadership opportunities for older children. New campers welcome. Some new repertoire this year. VOENA is an award-winning children’s a cappella choir, serving over 100 children ages 6 to 18 at two regional chapters in Benicia and Sonoma. 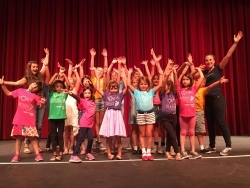 Director Annabelle Marie inspires children to celebrate music through voice, sound, rhythm, and physical expression. Singing in over 25 languages, VOENA has performed around the globe inspiring audiences at the 2012 London Olympics, the Grand Ole Opry, at the White House, for Pope John Paul II at the Vatican in Rome, Carnegie Hall with Grammy winner Eric Whitacre and as goodwill ambassadors to Bali, Italy, Ireland, China and Japan. VOENA was the first American choir to sing at the Soweto Festival in South Africa and they recently performed in Abu Dhabi for the Prince and other religious delegates at the Interface Alliance Forum to fight online child abuse in front of the beautiful Sheikh Zayed Grand Mosque spreading their mission to unite the world and empower future leaders through music.